Today is cold, windy, and dry here in Southern California and learning how to make lip balm couldn’t have come at a better time. I’ve slowly been working through wedding projects and one of them is making homemade lip balm for our wedding favors. The recipe is really simple and uses high quality ingredients that will moisturize and nourish the lips. My fiancé and I tried it out and the formula felt smooth with a soft texture that stays on your lips for hours. It’s perfect for dry windy days. Lips are so susceptible to drying out and it’s important to use a lip balm that doesn’t contain ingredients that get your lips hooked. Many formulas on the market actually cause your lips to become addicted to them because they offer just enough relief while actually keeping your lips chapped. Often they will contain menthol or camphor oils to give you the illusion that the formula is working, but the fact is they don’t! The lip balm recipe I’m going to share with you today does not contain those pesky ingredients. Your lips will stay hydrated and feel nourished and protected from the elements. Instead of having chronic chapped lips you’ll have healthy smooth ones that everyone else will be jealous of. Sounds good to me! I also want to mention that I’ve figured out how to make just ONE tube of lip balm for those of you looking for a quick recipe you can customize however you like. No more extra tubes of lip balm lying around for years without end! And, if you’r interested, you can get Young Living essential oils for 24% off HERE. • Once melted, remove the pyrex measuring cup from the pot. This is where you will add your essential oils! • Once all the tubes are filled let them sit until hardened before use and voila! You’ve got homemade lip balm that’s better than the store bought kind! If you are worried about the photosensitivity of orange essential oil, you can add 1 tsp of pure raspberry seed oil which has an spf of 28-40. You can also use a few drops of carrot seed essential oil which has an spf of 30-40 though it doesn’t smell as nice. This recipe makes 32 lip balm tubes worth of chap stick but you can easily divide or multiply the recipe to get the amount you need. The essential oils I used made a delightfully scented lip calm that makes you think of creamsicles and orange blossoms. Super yummy and uplifting for the senses! 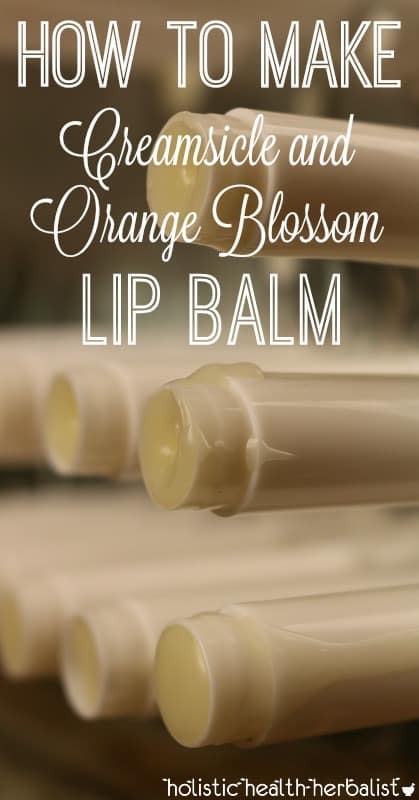 [yumprint-recipe id=’103′]Have you learned how to make lip balm yet? What have been your favorite lip balm flavors? Hi, Tash. I just wanna ask, can i use some other oil???? Because i don’t like almond oil. That looks pretty easy! I had always thought making lip balm would be more complicated. I don’t care for the commercial products because they feel so heavy and greasy (not to mention the unhealthy ingredients of course). Great tip about the raspberry seed oil, too! I’m pretty sensitive to the sun and have to be careful about anything that would increase photosensitivity. Absolutely agree with you, it is very easy. And you know what ingredients are in lip balm. You can be sure that is good for your lips. I should do this! My lips are SO DRY in the winter time. So that’s how you get it in the tube! That’s the smallest funnel I’ve ever seen. I need to get that for making lip balms. I’m such a clutz when I make mine and spill half of it outside the tubes! And I see you have a helper too. Love it. Great tutorial. I can smell it through the screen! They do smell divine! And the funnel does help! What a great idea for gifts! I would love to make lip balm. Thanks for the tutorial. Pinning this to our DIY board. I’ve wanted to do this for a long time! What a fun tutorial! I need to try this! What a great project! I didn’t realize it was that simple! I bet that smells so good too! Perfect! I bet that smells amazing. Pinned. I bet the scent is amazing! I have never made my own lip balm but would love to.